Hope you’re having a fun Summer so far! Here in Southwest Florida, it’s been great! The weather is sultry – some folks from up north think it is way too hot here. But I’ve been watching the weather reports. I’m here to tell you, it has been COOLER here than where some of you are right now. So, this month’s blog will be informative for everyone on our mailing list. With Buddy’s help, I’ve pulled together 10 safety tips that will make it more enjoyable to be outside with our Humans. DON’T stay in the car while your Human goes in to shop: I’ve said this in past blogs. A car, even with the window open a bit, can heat up just like an oven that’s been turned on for cooking. And just about that fast, here in Florida! 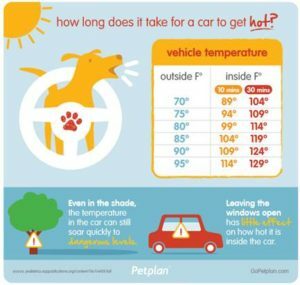 Florida has a Hot Car Law protecting pets! Heavy panting, dry or bright red gums, thick drool, wobbly legs. If you’re vomiting or have diarrhea, you’re in TROUBLE! Move us to a cool place, give us a drink of water, put a damp towel over our body, and take us to the vet ASAP. No cold water please, that can put us into shock. Activities in the shade can be much more fun, a little bit of direct sunlight is OK. Heavy exercise is not a good idea on a hot summer day. Hunker down in a cool spot. Use Sunscreen on your ears, nose and bellies. The Cats n Dogs store recommends Warren London Sunscreen, available online. If you need help getting some, let my Human know. Call 941-627-4093. Note to Fur Parents: us short- or light-haired furballs are particularly susceptible. And summer is NOT a good time to shave us down. 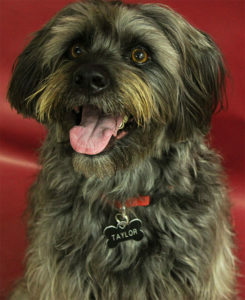 We dogs naturally shed our warm, winter hair so that what is left is designed to keep us cool! I know – it seems counter-intuitive. For cats, more frequent brushing can help prevent overheating. Walking on the streets and sidewalks around here is HOT!!! Most of us grow a protective layer of hair over your pads. But if your Human has that trimmed off, you might suggest getting a set of shoes or gripper socks. Give us a call at the Cat n Dog store, we can help! Max says that when his feet get hot, the rest of him heats up too. He is small, so his belly is close to the ground and gets hot too. He prefers to walk in the early AM or after dinner when it is a little cooler. Lucas told me the back of his Dad’s pickup truck is way too hot to ride in during the summer. Take your meds in the summer: Protect yourself with a good heartworm medicine that also includes protection against other lurking parasites and fleas. From your vet, it’s not too expensive. A Seresto collar, available at Cats n Dogs store, will help deter ticks and fleas. Water safety: If you go out boating with your Humans, consider a life jacket. Young Humans wear them, and so should you. Falling off a boat or a dock can be scary. Even if you swim well, you might get hurt. And for our up-north feline friends, be careful of sitting in open windows that have no screens. We don’t want you to fall out and get hurt! As I said, I love summer! Life in Port Charlotte is a little slower, quieter and relaxed. It’s fun to go to the doggie beach in Venice. I love the smell outside after an afternoon thunderstorm. What’s your favorite summer pastime? Drop us a note below. To our friends up north – hope your Summer is grand! We miss you! P.S. You might remember, I was the one who got sooooo nervous whenever there was a thunderstorm. My Mom would give me a biscuit with CBD oil in it. It calmed me down. Now, sometimes I don’t even need a biscuit. I’ve learned not to get nervous. They are available in the Cats n Dogs store. 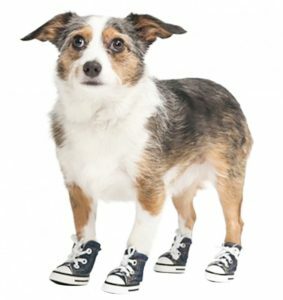 ShotVet.com offers affordable pet shots at the Cats N Dogs store every other Sunday, 3PM – 4PM. (2826 Tamiami Trail, Port Charlotte) No appointment necessary. August dates are Sunday, August 12th & August 26th.